Suspended Structures are those with horizontal planes i.e. floors are supported by cables (hangers) hung from the parabolic sag of large, high-strength steel cables. The strength of a suspended structure is derived from the parabolic form of the sagging high strength cable. To make this structure more efficient, the parabolic form is so designed that its shape closely follows the exact form of the moment diagrams. The sagging cable is more stable under symmetrical loading conditions as the cable may deform as it attempts to adjust to an eccentric loading. As the cable adjusts to this load its shifts the rest of the structure. This adjustment causes secondary stresses in the horizontal surface and additional deformation. The parabolic curve of the cable is also designed for various eccentric or lateral loads such as wind, seismic etc. The large curving cable may consist of many smaller cables which are tightly spun together. As the cables are being spun together, they are also stretched over the span and attached to the supports. After being assembled, the appropriate curve is created by tensioning the cable. The horizontal surfaces supported by the cable are hung piece by piece from the saggling cable. Usually, the horizontal surfaces are made of steel because of its lightweightness. Lightweight concrete mixtures are also used. The towers from where the cables are hung may be of steel, concrete. The cables are made up of steel. 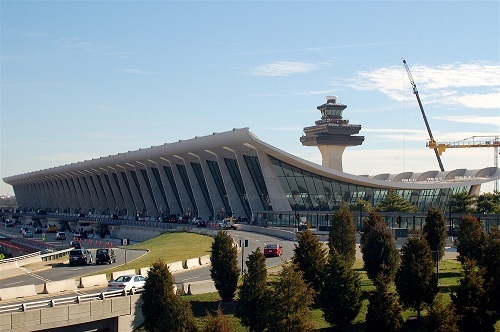 Dulles International airport was designed by Eero Saarinen. The cable roof structure spans 141 feet. It was constructed on a modular plan (Washington DC). The pillars are so designed that they become broader at their base. I am a nigerian, where can i study more on civil engineering. Thank you so much for your kind words. Do keep visiting my site. Awsome site 🙂 thank you .